Thermistors are a type of resistor where the resistance is dependent upon the temperature they are experiencing. These solid-state sensing elements come in two varieties, PTC and NTC types, the PTC (Positive Thermistors Coefficient) are usually used in cases like self-regulating heating elements. The NTC (Negative Temperature Coefficient) can be found in temperature sensors. 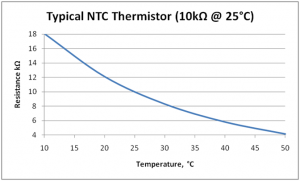 The properties of an NTC thermistor are that the resistance decreases as the temperature rises, this type of behaviour is effective against over voltage situations, quite often they are used parallel in a circuit. The reverse is true of the PTC thermistor, where it’s resistance increases as the temperature rises to protect components from over current situations. This behaviour lends these components to be more commonly used in series when used in circuits. A thermistor is at its basics an element used to regulate heat or the cold, the applications for this are wide and varied, but a few examples are for voltage regulation, time delay circuits and other applications. The many practical uses for these elements are applicable in for both personal, and on a greater scale, manufacturing products. Uses of thermistors can be found in equipment such as digital thermometers, microwaves, fire alarms, 3d printers (controls temperatures that need to be precise in order to create the final product), batteries and many more products that use this tiny industry evolving component to great effect. They are widely used in various industries across the world, everything from the food industry controlling the food handling process – over cooking, acceptable temperatures – stops millions in profit being lost through waste reduction. Utility companies are reliant on this component for the regulation of flow or overflow in current. In all, a variant of the resistor, they are constructed slightly different to the original resistor but it’s main personality trait is that its resistance is dependent on the temperature.